The word diversity, as defined in Websters Ninth New Collegiate Dictionary, is a simple, non-controversial term: to make diverse, give variety to. Within the geosciences, the term is most often used in studies with a biological flavor. For example, in an article published in the May 16, 2003, issue of Science, David Jablonski and co-authors confirmed that a significant increase in the diversity of marine animal speciation occurred during the Cenozoic Era. Interestingly, controversy over earlier studies on this subject focused not on the presence of diversity during the Cenozoic but on its absence in more ancient fossil sequences. Skeptics explain the differences as a result of selective sampling or preservation. In June, a conference was held in College Park, Md., to explore another situation where diversity is lacking. In this case, it was not the geological record but the geosciences community itself that was the target of discussion. The Joint Society Conference on Increasing Diversity in the Earth and Space Sciences (IDEaSS Conference) was motivated by concerns of equity, but more pragmatic considerations also played a role. In an era of declining student enrollments, loss of geoscience departments, upcoming Baby Boomer retirements and turbulent employment conditions, the need to strengthen and revitalize the geoscientific workforce has taken on new urgency. For many earth scientists, broadening participation is an essential strategy in the battle to achieve this goal. If we expect to succeed with future efforts to broaden participation in the geosciences, we must understand the origins of our past failure to recruit and retain a diverse population. A community-wide conversation on increasing diversity is vital to achieving such understanding and identifying effective solutions to the problem. The IDEaSS Conference was intended to begin this dialogue. Students at the IDEaSS Conference. Photo by Harvey Leifert, American Geophysical Union. Despite its simple definition, when the word diversity refers to people, many interpretations are possible. To have a productive conversation, we must first define a common ground and agree on the boundaries of the discussion. What do we really mean by diversity? Within the United States, the term most commonly refers to the concept of including more women, cultural and ethnic minorities, and persons with disabilities in fields traditionally dominated by white males. Recent studies reveal sustained growth in the number of women participating in the earth and space sciences at both undergraduate and graduate levels, although participation rates still lag well behind current population demographics. Unfortunately, a disproportionate number of women geoscience doctorates choose to pursue careers outside academe, thus reducing their visibility as role models for female students considering this profession (see sidebars). The picture is dramatically worse for ethnic and cultural minorities, with the geosciences ranking among the lowest for minority participation in science. As Roman Czujko, director of the Statistical Research Center at the American Institute of Physics (AIP), often observes, The geosciences make physics look good! Failure to recruit substantial numbers of educated African Americans, Hispanic Americans and Native Americans into the geosciences is due to many complex causes. Significant population growth in these combined communities is projected over the next decade, to the point where they will become the underrepresented majority unless things change. For persons with disabilities, who comprise nearly one-fifth of the adult population, available information on their status is insufficient. A large portion of the next generation of geoscience students and professionals within the United States will need to originate from all of these currently underutilized sectors of the population. Diversity also refers to the increasingly international and multicultural community engaged in our profession. Many of the large U.S.-owned energy corporations now have worldwide operations, internationally distributed management, or have been bought out or merged into foreign companies. Within some industry sectors, such as mining and mineral resources, most of the job market lies outside the United States. Evolution in geoscience employment opportunities  an outgrowth of both economic globalization and the increasing porosity of national borders  has increased demand for a skilled and mobile geoscientific workforce prepared to tolerate and work effectively within many different cultural settings. Globalization is also reflected in the memberships and programs of the scientific societies and professional organizations that support the earth science community. More than 50 percent of the members in the Society of Economic Geologists now live outside the United States. A-List organizations  those with American in their name  face increasing challenges to broaden their attitudes and activities in ways that serve the distinct interests of their international members. Increased use of the more neutral AGU moniker by the American Geophysical Union, which has 12,000 non-U.S. members in 130 countries, is a sign of the times. 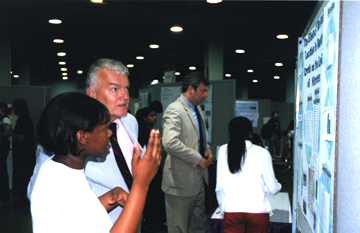 The American Geophysical Union (AGU) brought two groups of high school students, from the Greater Richmond Area Higher Education Consortium and the Model Secondary School for the Deaf at Gallaudet University, to the 2002 Spring AGU Meeting  for a special symposium on earth and space sciences and a high school poster session, seen here. Photo by Harvey Leifert, AGU. Rapidly changing disciplinary boundaries offer a third viewpoint on diversity. Todays geoscientists are a varied lot that include atmospheric scientists, planetary geologists, oceanographers, space physicists, hydrologists and even biogeologists among their ranks. Yet we wrestle with the proper taxonomy for our disciplines  how to draw the professional lines, how to count the bodies? Are environmental scientists included? What about GIS professionals or geomorphologists, who are spawned more often from geography departments than from geology departments? Seemingly trivial questions, perhaps, but they are critically important in defining the present geoscience community, assessing future workforce needs and gauging the need for diversity. Add in the complexities of counting a global and transient workforce, and it is easy to see how the arguments can become murky and imprecise. With so many perspectives and without knowing reliably and quantitatively who we really are as a professional community, it is challenging to have a coherent dialogue on diversity. In my view, we must consider all of these perspectives, for they are not easily separable. A robust and fully representative U.S. workforce is as critical to the health of our profession as is a portable, adaptable and global network of scientists. On June 10, amid the backdrop of U.S. Supreme Court affirmative action deliberations, nearly 70 scientists and society staff members convened at the American Center of Physics to begin a three-day conversation on increasing diversity in the geosciences. Twenty-seven different scientific organizations and six federal agencies attended the IDEaSS Conference. In the room were Goliaths, such as the 39,000-member-strong American Association of Petroleum Geologists, as well as Davids like the 250-member Association of Earth Science Editors, but each participated with equal voice. Minority-membership organizations, such as the National Society of Hispanic Physicists and the National Association for Black Geologists and Geophysicists, attended as well. Several of the major physics societies, which are equally concerned about diversity, joined in the discussion. The concept of a multisociety conference on diversity originated with AGUs Committee on Education and Human Resources (CEHR) as one component of its new diversity plan, released in May 2002 (www.agu.org/sci_soc/education/diversity.html). While the plan targets AGU programs, CEHR recognized that well-coordinated partnerships might best achieve several key objectives. CEHR identified two main goals for the conference. The first was to educate participants about the need for increasing diversity and to identify some of the successful diversity programs currently offered. The second goal was to explore the concept of a multisociety coalition on diversity. 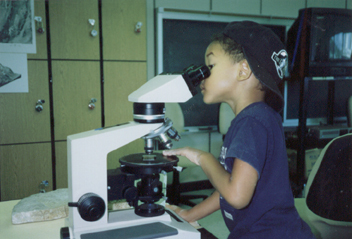 An elementary school student looks at rocks in thin sections while attending the 1997 School of Ocean and Earth Science and Technology Open House at the University of Hawaii at Manoa  one of several outreach programs to bring students from underrepresented communities onto university campuses. Photo courtesy of Jill Karsten. The conference focused on the unique role that scientific societies can play in promoting diversity in the geosciences, although some consideration was also given to how the societies could mesh their efforts with those of academia, government and industry. The emphasis was on the first definition  the issue of increasing recruitment and retention of women, minorities and persons with disabilities. A multisociety planning committee, chaired by James H. Stith, vice president of AIPs Physics Resources Division, developed the conference agenda. Presentations reviewed current demographics in the geoscience community and explored topics such as gender differences that contribute to decisions to leave the profession, initiatives to increase technological infrastructure at tribal colleges and universities, and new partnerships to support programs for minority graduate scientists. A poster session on the first evening highlighted existing diversity programs within professional societies and was followed by a panel discussion that explored the essential ingredients of effective programs. The second evening highlighted diversity programs sponsored by federal agencies and included a report about new initiatives to improve cross-agency coordination. A formal conference report will be available this fall. There have been a lot of well-intentioned programs in the last 28 years; the bottom line is that we havent been very effective, suggested John Snow, dean of the University of Oklahomas College of Geosciences. Its not a pipeline problem, its a spigot problem, argued Lawrence Norris of the National Society of Black Physicists. The remarkably frank and often passionate attitudes shared by participants during plenary and break-out group discussions proved to be a hallmark of the conference. Alternating between respectful disagreement, realism and optimism, conference attendees remained focused on setting an ambitious goal and agenda for the community. All participants felt strongly that working in partnership was essential to making progress, but recognized the many challenges to getting official buy-in from the organizations they represented. One of the greatest obstacles will be to create a coordinated program that can mesh with the many different missions and priorities of these various organizations. Deliberations on that question consumed much of the final day: Should we coordinate, collaborate or form a coalition? Carolyn Randolph, outgoing president of the National Science Teachers Association, outlined the challenges of building formal coalitions and making them work. Subsequent discussions considered the pros and cons of establishing a formal joint society coalition on diversity. A coalition allows participants to speak with a unified voice  an obvious strength of such an arrangement  and brings added value by leveraging resources, avoiding duplication and steering the allocation of funding agency priorities. Potential drawbacks include the more cumbersome communication and organizational processes that a formal structure would entail. A resolution drafted during the conference frames the rationale behind and priorities for a collaborative society effort on diversity. The final language is still undergoing comment and revision. We observed significant overlap between the recommendations identified during the IDEaSS Conference and those contained in the draft report of the 2003 Task Force on National Workforce Policies for Science and Engineering, issued by the National Science Board (NSB) last spring and summarized by NSB Senior Policy Analyst Jean Pomeroy. The draft IDEaSS Conference resolution endorses the recommendations of the NSB report and offers to help with their implementation within the earth, ocean, space and physical sciences communities. An initial priority is to establish a Web-based, centralized and comprehensive clearinghouse with information on the need for increasing diversity, related background materials and a digest of resources and best practices that can be used by organization members and their home institutions to help encourage diversity. Providing this community resource through the Digital Library for Earth System Education, a national grass-roots program funded by the National Science Foundation, seems most logical. A second priority is to develop and promote a centralized repository of culturally sensitive career information and biographies or profiles of scientists and other professionals in the earth and space sciences, to which any society can contribute. The goal now is to sustain the momentum of the IDEaSS Conference by garnering broader and more formal support for a joint society effort on increasing diversity. In the next four months, conference participants will work through the governance structures of their own organizations to seek support for the final draft resolution and coalition concept. They will also determine what resources their organization might be willing to commit to such an effort. We recognize that some attrition will occur during this phase, but also hope that groups unable to attend the conference will now join the cause. Websters offers a second common definition for diversity. It concerns a strategy to balance (as an investment portfolio) defensively. As we continue our dialogue on the status of the earth science workforce and contemplate our future investments in maintaining its vigor, it is imperative that we pursue diversification. This is sound business practice. New attitudes and innovative strategies will be necessary. The IDEaSS Conference has begun to identify what those might be. Eventually, we will need to move beyond conversation and put our words into action. At that step, a community-wide commitment will be crucial. Higher education in the United States is a large and competitive system. Each year, more than 1.2 million people earn bachelors degrees in the United States. The geosciences are comparatively small with about 4,000 bachelors degrees awarded annually in geology, atmospheric sciences, geophysics, oceanography and space science combined. Similarly, more than 42,000 people earn Ph.D.s in the United States each year, but only about 800 of those degrees are in the geosciences. Here we provide a snapshot of two illustrative trends regarding diversity in geoscience education: the rise in participation among females at the bachelors level and the sobering statistics on ethnic minority participation in the geosciences. The U.S. Department of Education collected the bachelors level data and the National Science Foundation collected the Ph.D. data. Because the geosciences are small compared to the total U.S. higher-education system, large swings in the demographic profile of students are visible over a short time scale. One such example is gender diversity in the geosciences. The representation of women among bachelors degree recipients in the geosciences has nearly doubled over the last 15 years. The growth rate for the participation of women in the geosciences has been very strong, going from 22 percent in 1986 to 40 percent for the bachelors class of 2000. However, the levels are well below the average for all fields. The representation of women among geoscience bachelors is ahead of several related disciplines like physics and engineering, but lags behind other fields, such as mathematics, chemistry and the life sciences. In addition, the participation of women is uneven by specialty among the geosciences. Geology, in part because it is relatively large, displays representation rates that are consistent with the average for all geoscience bachelors. Oceanography grew the fastest, with the representation of women among bachelors degrees jumping from 18 percent in 1986 to 49 percent in 2000. Women earned barely more than 20 percent of the bachelors degrees awarded in atmospheric science in 2000. To a significant extent, the choices that women make are driving higher education. Currently, women earn about 58 percent of all bachelors degrees. This is the result of a gradual increase in the participation of women in higher education  a trend thats been in progress for decades. The National Center for Education Statistics projects that this trend will continue and that women will earn at least 60 percent of the bachelors degrees awarded in 2010. Thus, staying competitive with other fields will depend, in part, on the ability of the geosciences to attract and retain women into the discipline. The record for attracting and retaining ethnic minorities into the geosciences is very poor. In fact, at the bachelors degree level, no other scientific field has a lower participation among either African Americans or Hispanic Americans than do the geosciences. Of all bachelors degrees awarded in the United States in 2000, African Americans and Hispanic Americans earned 8.7 percent and 6.1 percent, respectively. Among geoscience bachelors awarded that year, African Americans and Hispanic Americans earned a mere 1.3 percent and 3.1 percent, respectively. Over the past 28 years, out of the approximately 20,000 people who earned geoscience Ph.D.s in the United States, only 263 were Hispanic American and only 107 were African American. Graph provided by Roman Czujko and Megan Henly. To put these paltry participation rates in a different light, more than 100,000 African Americans and more than 75,000 Hispanic Americans earned bachelors degrees across all fields during the academic year 1999-2000. However, during that year, only 55 of the African Americans and 125 of the Hispanic Americans earned bachelors degrees in any of the geosciences. Ph.D.s is still extremely small. 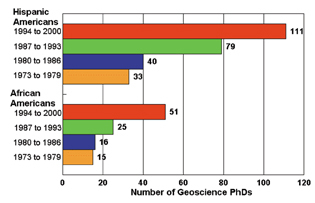 Over the last 28 years, about 20,000 people earned geoscience Ph.D.s in the United States. Of them, only 107 were African Americans and 263 were Hispanic Americans. It should be noted that these trends reflect more than the size of geosciences relative to other Ph.D. fields. For example, over the last 28 years, more than 32,600 African Americans and more than 21,000 Hispanic Americans earned Ph.D.s across all fields in the United States. Clearly, very, very few of them did so in any of the geosciences. On the positive side of the ledger, the number of both African Americans and Hispanic Americans who earned geoscience Ph.D.s over the past seven years is more than three times larger than in the mid-1970s. These statistics are only the tip of a much larger data iceberg. Two reports, published by the American Institute of Physics, contain a great deal of information about minorities in the sciences. One report describes the participation of African Americans in physics and in the geosciences. The other describes the participation of Hispanic Americans in physics and in the geosciences. These reports include lists of universities that have produced the largest numbers of minorities in the geosciences, and were made possible by the support of the David and Lucile Packard Foundation. Similarly, there is a wealth of data on women in the geosciences. A copy of a poster paper presented at the AGU meeting in December 2002 is also available on the Web. To download any of these reports, please see the list below. Czujko is the Director of the Statistical Research Center of the American Institute of Physics (AIP). Henly also works at AIP. The Statistical Research Center conducts studies that document the education trends in physics and related disciplines in the United States from high school through graduate school. Karsten is manager of education and career services at the American Geophysical Union (AGU). Prior to joining AGU, she spent 12 years as a research faculty member in the Department of Geology and Geophysics at the University of Hawaii at Manoa, where she investigated mid-ocean ridge processes in the northeast and southeast Pacific Oceans. E-mail: jkarsten@agu.org. For more information about the IDEaSS Conference program, participants and outcomes, click here. The conference was funded by NASA, the National Science Foundation, the National Oceanic and Atmospheric Administration, the U.S. Geological Survey and the U.S. Environmental Protection Agency. The Quiet Crisis: Falling Short in Producing American Scientific and Technical Talent, by Shirley Ann Jackson, Building Engineering and Science Talent position paper, 12 pp., 2002. Land of Plenty: Diversity as America's Competitive Edge in Science, Engineering and Technology, Report of the Congressional Commission on the Advancement of Women and Minorities in Science, Engineering and Technology Development (CAWMSET), 104 pp., 2000. NSF 01-53: Report of the Geosciences Diversity Workshop, National Science Foundation, 2000.